This article is about the stringed musical instrument. For other uses, see Cello (disambiguation). Cello, front and side view. The endpin at the bottom is retracted or removed for easier storage and transportation, and adjusted for height in accordance to the player. The cello (/ˈtʃɛloʊ/ CHEL-oh; plural cellos or celli) or violoncello (/ˌvaɪələnˈtʃɛloʊ/ VY-ə-lən-CHEL-oh; Italian pronunciation: [vjolonˈtʃɛllo]) is a string instrument. It is played by bowing or plucking its four strings, which are usually tuned in perfect fifths an octave lower than the viola: from low to high, C2, G2, D3 and A3. It is the bass member of the violin family, which also includes the violin, viola and the double bass, which doubles the bass line an octave lower than the cello in much of the orchestral repertoire. After the double bass, it is the second-largest and second lowest (in pitch) bowed string instrument in the modern symphony orchestra. The cello is used as a solo instrument, as well as in chamber music ensembles (e.g., string quartet), string orchestras, as a member of the string section of symphony orchestras, most modern Chinese orchestras, and some types of rock bands. The name cello is derived from the ending of the Italian violoncello, which means "little violone". Violone ("big viola") was a large-sized member of viol (viola da gamba) family or the violin (viola da braccio) family. The term "violone" today usually refers to the lowest-pitched instrument of the viols, a family of stringed instruments that went out of fashion around the end of the 17th century in most countries except England and, especially, France, where they survived another half-century before the louder violin family came into greater favour in that country as well. In modern symphony orchestras, it is the second largest stringed instrument (the double bass is the largest). 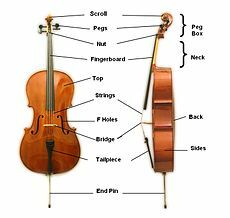 Thus, the name "violoncello" contained both the augmentative "-one" ("big") and the diminutive "-cello" ("little"). By the turn of the 20th century, it had become common to shorten the name to 'cello, with the apostrophe indicating the missing stem. It is now customary to use "cello" without apostrophe as the full designation. Viol is derived from the root viola, which was derived from Medieval Latin vitula, meaning stringed instrument. Cellos are tuned in fifths, starting with C2 (two octaves below middle C), followed by G2, D3, and then A3. It is tuned in the same intervals as the viola, but an octave lower. Unlike the violin or viola but similar to the double bass, the cello has an endpin that rests on the floor to support the instrument's weight. The cello is most closely associated with European classical music, and has been described as the closest sounding instrument to the human voice. The instrument is a part of the standard orchestra, as part of the string section, and is the bass voice of the string quartet (although many composers give it a melodic role as well), as well as being part of many other chamber groups. Among the most well-known Baroque works for the cello are Johann Sebastian Bach's six unaccompanied Suites. The cello possibly figures as a member of the basso continuo group in chamber works by Francesca Caccini (1587–1641), Barbara Strozzi (1619–1677) with pieces such as Il primo libro di madrigali, per 2–5 voci e basso continuo, op. 1 and Elisabeth Jacquet de La Guerre (1665–1729) who wrote six sonatas for violin and basso continuo. From the Classical era, the two concertos by Joseph Haydn in C major and D major stand out, as do the five sonatas for cello and pianoforte of Ludwig van Beethoven, which span the important three periods of his compositional evolution. A Divertimento for Piano, Clarinet, Viola and Cello is among the surviving works by Duchess Anna Amalia of Brunswick-Wolfenbüttel (1739–1807). A review of compositions for cello in the Romantic era must include the German composer Fanny Mendelssohn (1805–1847) who wrote the Fantasy in G minor for cello and piano and a Capriccio in A-flat for cello. Other well-known works of the era include the Robert Schumann Concerto, the Antonín Dvořák Concerto as well as the two sonatas and the Double Concerto by Johannes Brahms. Compositions from the late-19th and early 20th century include three cello sonatas (including the Cello Sonata in C Minor written in 1880) by Dame Ethel Smyth (1858–1944), Edward Elgar's Cello Concerto in E minor, Claude Debussy's Sonata for Cello and Piano, and unaccompanied cello sonatas by Zoltán Kodály and Paul Hindemith. Pieces including cello were written by American Music Cente founder Marion Bauer (1882–1955) (two trio sonatas for flute, cello and piano) and Ruth Crawford Seeger (1901–1953) (Diaphonic suite No. 2 for bassoon and cello). Polish composer Grażyna Bacewicz (1909–1969) was writing for cello in the mid 20th century with Concerto No. 1 for Cello and Orchestra (1951), Concerto No. 2 for Cello and Orchestra (1963) and in 1964 composed her Quartet for four cellos. The cello's versatility made it popular with many male composers in this era as well, such as Sergei Prokofiev, Dmitri Shostakovich, Benjamin Britten, György Ligeti, Witold Lutoslawski and Henri Dutilleux. Well-known cellists include Jacqueline du Pre, Raya Garbousova, Zara Nelsova, Hildur Gudnadottir, Han-Na Chang, Mstislav Rostropovich and Beatrice Harrison. Others include Anner Bylsma, Yo-Yo Ma, Pablo Casals, Julian Lloyd Webber, Alfred Wallenstein, Mischa Maisky and Gregor Piatigorsky. See the comprehensive list of cellists here. In the 2010s, the instrument is found in popular music, but was more commonly used in 1970s pop and disco music. Today it is sometimes featured in pop and rock recordings, examples of which are noted later in this article. 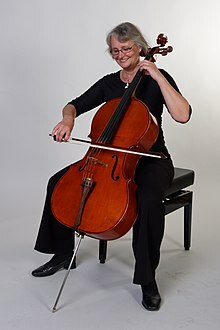 The cello has also appeared in major hip-hop and R & B performances, such as singers Rihanna and Ne-Yo's 2007 performance at the American Music Awards. The instrument has also been modified for Indian classical music by Nancy Lesh and Saskia Rao-de Haas. 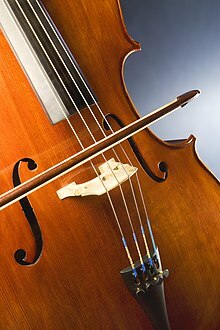 The direct ancestor to the violoncello was the bass violin. Monteverdi referred to the instrument as "basso de viola da braccio" in Orfeo (1607). Although the first bass violin, possibly invented as early as 1538, was most likely inspired by the viol, it was created to be used in consort with the violin. The bass violin was actually often referred to as a "violone", or "large viola", as were the viols of the same period. Instruments that share features with both the bass violin and the viola da gamba appear in Italian art of the early 16th century. The invention of wire-wound strings (fine wire around a thin gut core), around 1660 in Bologna, allowed for a finer bass sound than was possible with purely gut strings on such a short body. Bolognese makers exploited this new technology to create the cello, a somewhat smaller instrument suitable for solo repertoire due to both the timbre of the instrument and the fact that the smaller size made it easier to play virtuosic passages. This instrument had disadvantages as well, however. The cello's light sound was not as suitable for church and ensemble playing, so it had to be doubled by organ, theorbo or violone. Around 1700, Italian players popularized the cello in northern Europe, although the bass violin (basse de violon) continued to be used for another two decades in France. Many existing bass violins were literally cut down in size to convert them into cellos according to the smaller pattern developed by Stradivarius, who also made a number of old pattern large cellos (the 'Servais'). The sizes, names, and tunings of the cello varied widely by geography and time. The size was not standardized until around 1750. Despite similarities to the viola da gamba, the cello is actually part of the viola da braccio family, meaning "viol of the arm", which includes, among others, the violin and viola. Though paintings like Bruegel's "The Rustic Wedding", and Jambe de Fer in his Epitome Musical suggest that the bass violin had alternate playing positions, these were short-lived and the more practical and ergonomic a gamba position eventually replaced them entirely. A baroque cello strung with gut strings. Note the absence of fine-tuning pins on the tailpiece. Baroque-era cellos differed from the modern instrument in several ways. The neck has a different form and angle, which matches the baroque bass-bar and stringing. [clarification needed] Modern cellos have an endpin at the bottom to support the instrument (and transmit some of the sound through the floor), while Baroque cellos are held only by the calves of the player. Modern bows curve in and are held at the frog; Baroque bows curve out and are held closer to the bow's point of balance. Modern strings normally have a metal core, although some use a synthetic core; Baroque strings are made of gut, with the G and C strings wire-wound. Modern cellos often have fine-tuners connecting the strings to the tailpiece, which make it much easier to tune the instrument, but such pins are rendered ineffective by the flexibility of the gut strings used on Baroque cellos. Overall, the modern instrument has much higher string tension than the Baroque cello, resulting in a louder, more projecting tone, with fewer overtones. Few educational works specifically devoted to the cello existed before the 18th century, and those that do exist contain little value to the performer beyond simple accounts of instrumental technique. One of the earliest cello manuals is Michel Corrette's Méthode, thèorique et pratique pour apprendre en peu de temps le violoncelle dans sa perfection (Paris, 1741). Cellos are part of the standard symphony orchestra, which usually includes eight to twelve cello players. The cello section, in standard orchestral seating, is located on stage left (the audience's right) in the front, opposite the first violin section. However, some orchestras and conductors prefer switching the positioning of the viola and cello sections. The principal cellist is the section leader, determining bowings for the section in conjunction with other string principals, playing solos and leading entrances (when the section begins to play its part). Principal players always sit closest to the audience. The cellos are a critical part of orchestral music; all symphonic works involve the cello section, and many pieces require cello soli or solos. Much of the time, cellos provide part of the low-register harmony for the orchestra. Often, the cello section plays the melody for a brief period, before returning to the harmony role. There are also cello concertos, which are orchestral pieces that feature a solo cellist accompanied by an entire orchestra. There are numerous cello concertos – where a solo cello is accompanied by an orchestra – notably 25 by Vivaldi, 12 by Boccherini, at least 3 by Haydn, 3 by C. P. E. Bach, 2 by Saint-Saëns, 2 by Dvořák, and one each by Robert Schumann], Lalo, and Elgar. There were also some cellists who, while not otherwise composers, did write cello-specific repertoire, such as Nikolaus Kraft who wrote six cello concertos. Beethoven's Triple Concerto for Cello, Violin and Piano and Brahms' Double Concerto for Cello and Violin are also part of the concertante repertoire although in both cases the cello shares solo duties with at least one other instrument. Moreover, several composers wrote large-scale pieces for cello and orchestra, which are concertos in all but name. Some familiar "concertos" are Richard Strauss' tone poem Don Quixote, Tchaikovsky's Variations on a Rococo Theme, Bloch's Schelomo and Bruch's Kol Nidrei. In the 20th century, the cello repertoire grew immensely. This was partly due to the influence of virtuoso cellist Mstislav Rostropovich, who inspired, commissioned and premiered dozens of new works. Among these, Prokofiev's Symphony-Concerto, Britten's Cello Symphony, the concertos of Shostakovich and Lutosławski as well as Dutilleux's Tout un monde lointain... have already become part of the standard repertoire. Other major composers who wrote concertante works for him include Messiaen, Jolivet, Berio and Penderecki. In addition, Arnold, Barber, Glass, Hindemith, Honegger, Ligeti, Myaskovsky, Penderecki, Rodrigo, Villa-Lobos and Walton also wrote major concertos for other cellists, notably for Gaspar Cassadó, Aldo Parisot, Gregor Piatigorsky, Siegfried Palm and Julian Lloyd Webber. There are also many sonatas for cello and piano. Those written by Beethoven, Mendelssohn, Chopin, Brahms, Grieg, Rachmaninoff, Debussy, Fauré, Shostakovich, Prokofiev, Poulenc, Carter, and Britten are particularly well known. Other important pieces for cello and piano include Schumann's five Stücke im Volkston and transcriptions like Schubert's Arpeggione Sonata (originally for arpeggione and piano), César Franck's Cello Sonata (originally a violin sonata, transcribed by Jules Delsart with the composer's approval), Stravinsky's Suite italienne (transcribed by the composer – with Gregor Piatigorsky – from his ballet Pulcinella) and Bartók's first rhapsody (also transcribed by the composer, originally for violin and piano). There are pieces for cello solo, J. S. Bach's six Suites for Cello (which are among the best-known solo cello pieces), Kodály's Sonata for Solo Cello and Britten's three Cello Suites. Other notable examples include Hindemith's and Ysaÿe's Sonatas for Solo Cello, Dutilleux's Trois Strophes sur le Nom de Sacher, Berio's Les Mots Sont Allés, Cassadó's Suite for Solo Cello, Ligeti's Solo Sonata, Carter's two Figments and Xenakis' Nomos Alpha and Kottos. The cello is a member of the traditional string quartet as well as string quintets, sextet or trios and other mixed ensembles. There are also pieces written for two, three, four or more cellos; this type of ensemble is also called a "cello choir" and its sound is familiar from the introduction to Rossini's William Tell Overture as well as Zaccharia's prayer scene in Verdi's Nabucco. Tchaikovsky's 1812 Overture also starts with a cello ensemble, with four cellos playing the top lines and two violas playing the bass lines. As a self-sufficient ensemble, its most famous repertoire is Villa-Lobos' first of his Bachianas Brasileiras for cello ensemble (the fifth is for soprano and 8 cellos). Other examples are Offenbach's cello duets, quartet, and sextet, Pärt's Fratres for 8 cellos and Boulez' Messagesquisse for 7 cellos, or even Villa-Lobos' rarely played Fantasia Concertante (1958) for 32 cellos. The 12 cellists of the Berlin Philharmonic Orchestra (or "the Twelve" as they have since taken to being called) specialize in this repertoire and have commissioned many works, including arrangements of well-known popular songs. The cello is less common in popular music than in classical music. Several bands feature a cello in their standard line-up, e.g. Joe Kwon of The Avett Brothers. The more common use in pop and rock is to bring the instrument in for a particular song. In the 1960s, artists such as the Beatles and Cher used the cello in popular music, in songs such as The Beatles' "Yesterday", "Eleanor Rigby" and "Strawberry Fields Forever", and Cher's "Bang Bang (My Baby Shot Me Down)". "Good Vibrations" by the Beach Boys includes the cello in its instrumental ensemble, which includes a number of instruments unusual for this sort of music. Bass guitarist Jack Bruce, who had originally studied music on a performance scholarship for cello, played a prominent cello part in "As You Said" on Cream's Wheels of Fire studio album (1968). In the 1970s, the Electric Light Orchestra enjoyed great commercial success taking inspiration from so-called "Beatlesque" arrangements, adding the cello (and violin) to the standard rock combo line-up and in 1978 the UK based rock band, Colosseum II, collaborated with cellist Julian Lloyd Webber on the recording Variations. Most notably, Pink Floyd included a cello solo in their 1970 epic instrumental "Atom Heart Mother". Bass guitarist Mike Rutherford of Genesis was originally a cellist and included some cello parts in their Foxtrot album. Established non-traditional cello groups include Apocalyptica, a group of Finnish cellists best known for their versions of Metallica songs, Rasputina, a group of cellists committed to an intricate cello style intermingled with Gothic music, the Massive Violins, an ensemble of seven singing cellists known for their arrangements of rock, pop and classical hits, Von Cello, a cello fronted rock power trio, Break of Reality who mix elements of classical music with the more modern rock and metal genre, Cello Fury, a cello rock band that performs original rock/classical crossover music, and Jelloslave, a Minneapolis-based Cello duo with two percussionists. These groups are examples of a style that has become known as cello rock. The crossover string quartet bond also includes a cellist. Silenzium and Cellissimo Quartet are Russian (Novosibirsk) groups playing rock and metal and having more and more popularity in Siberia. Cold Fairyland from Shanghai, China is using a cello along a Pipa as the main solo instrument to create East meets West progressive (folk) rock. More recent bands using the cello are Clean Bandit, Aerosmith, The Auteurs, Nirvana, Oasis, Smashing Pumpkins, James, Talk Talk, Phillip Phillips, OneRepublic, and the baroque rock band Arcade Fire. An Atlanta-based trio, King Richard's Sunday Best, also uses a cellist in their lineup. So-called "chamber pop" artists like Kronos Quartet, The Vitamin String Quartet and Margot and the Nuclear So and So's have also recently made cello common in modern alternative rock. Heavy metal band System of a Down has also made use of the cello's rich sound. The indie rock band The Stiletto Formal are known for using a cello as a major staple of their sound, similarly, the indie rock band Canada employs two cello players in their lineup. The orch-rock group, The Polyphonic Spree, which has pioneered the use of stringed and symphonic instruments, employs the cello in very creative ways for many of their "psychedelic-esque" melodies. The first wave screamo band I Would Set Myself On Fire For You featured a cello as well as a viola to create a more folk-oriented sound. The band, Panic! at the Disco uses a cello in their song, "Build God, Then We'll Talk". The lead vocalist of the band, Brendon Urie, also did the recording of the cello solo. The Lumineers added cellist Nela Pekarek to the band in 2010. She plays cello, sings harmony and duets. In jazz, bassists Oscar Pettiford and Harry Babasin were among the first to use the cello as a solo instrument; both tuned their instrument in fourths, an octave above the double bass. Fred Katz (who was not a bassist) was one of the first notable jazz cellists to use the instrument's standard tuning and arco technique. Contemporary jazz cellists include Abdul Wadud, Diedre Murray, Ron Carter, Dave Holland, David Darling, Lucio Amanti, Akua Dixon, Ernst Reijseger, Fred Lonberg-Holm, Tom Cora and Erik Friedlander. Modern musical theatre pieces like Jason Robert Brown's The Last Five Years, Duncan Sheik's Spring Awakening, Adam Guettel's Floyd Collins, and Ricky Ian Gordon's My Life with Albertine use small string ensembles (including solo cellos) to a prominent extent. In Indian Classical music Saskia Rao-de Haas is a well established soloist as well as playing duets with her sitarist husband Pt. Shubhendra Rao. Other cellists performing Indian classical music are: Nancy Lesh (Dhrupad) and Anup Biswas. Both Rao and Lesh play the cello sitting cross-legged on the floor. The cello can also be used in bluegrass and folk music, with notable players including Ben Sollee of the Sparrow Quartet and the "Cajun cellist" Sean Grissom, as well as Vyvienne Long who, in addition to her own projects, has played for those of Damien Rice. Cellists such as Natalie Haas, Abby Newton and Liz Davis Maxfield have contributed significantly to the use of cello playing in Celtic folk music, often with the cello featured as a primary melodic instrument and employing the skills and techniques of traditional fiddle playing. Lindsay Mac is becoming well known for playing the cello like a guitar, with her cover of The Beatles' "Blackbird". The cello is typically made from carved wood, although other materials such as carbon fiber or aluminum may be used. A traditional cello has a spruce top, with maple for the back, sides, and neck. Other woods, such as poplar or willow, are sometimes used for the back and sides. Less expensive cellos frequently have tops and backs made of laminated wood. Laminated cellos are widely used in elementary and secondary school orchestras and youth orchestras, because they are much more durable than carved wood cellos (i.e., they are less likely to crack if bumped or dropped) and they are much less expensive. The top and back are traditionally hand-carved, though less expensive cellos are often machine-produced. The sides, or ribs, are made by heating the wood and bending it around forms. 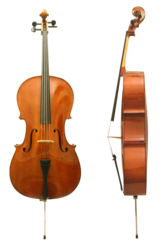 The cello body has a wide top bout, narrow middle formed by two C-bouts, and wide bottom bout, with the bridge and F holes just below the middle. The top and back of the cello has decorative border inlay known as purfling. While purfling is attractive, it is also functional: if the instrument is struck, the purfling can prevent cracking of the wood. A crack may form at the rim of the instrument, but spreads no further. Without purfling, cracks can spread up or down the top or back. Playing, traveling and the weather all affect the cello and can increase a crack if purfling is not in place. Less expensive instruments typically have painted purfling. Cello manufacturer Luis & Clark constructs cellos from carbon fibre. Carbon fibre instruments are particularly suitable for outdoor playing because of the strength of the material and its resistance to humidity and temperature fluctuations. Luis & Clark has produced over 1000 cellos, some of which are owned by cellists such as Yo-Yo Ma and Josephine van Lier. In the late 1920s and early 1930s, the Aluminum Company of America (Alcoa) as well as German luthier G.A. Pfretzschner produced an unknown number of aluminum cellos (in addition to aluminum double basses and violins). Above the main body is the carved neck. The neck has a curved cross-section on its underside, which is where the player's thumb runs along the neck during playing. The neck which leads to a pegbox and the scroll. The neck, pegbox, and scroll are normally carved out of a single piece of wood, usually maple. The fingerboard is glued to the neck and extends over the body of the instrument. The fingerboard is given a curved shape, matching the curve on the bridge. Both the fingerboard and bridge need to be curved so that the performer can bow individual strings. If the cello were to have a flat fingerboard and bridge, as with a typical guitar, the performer would only be able to bow the "outer" two strings or bow all the strings. The performer would not be able to play the "inner" two strings alone. The nut is a raised piece of wood, fitted where the fingerboard meets the pegbox, in which the strings rest in shallow slots or grooves to keep them the correct distance apart. The pegbox houses four tapered tuning pegs, one for each string. The pegs are used to tune the cello by either tightening or loosening the string. The pegs are called "friction pegs", because they maintain their position by friction. The scroll is a traditional ornamental part of the cello and a feature of all other members of the violin family. Ebony is usually used for the tuning pegs, fingerboard, and nut, but other hardwoods, such as boxwood or rosewood, can be used. Black fittings on low-cost instruments are often made from inexpensive wood that has been blackened or "ebonized" to look like ebony, which is much harder and more expensive. Ebonised parts such as tuning pegs may crack or split, and the black surface of the fingerboard will eventually wear down to reveal the lighter wood underneath. Historically, cello strings had cores made out of catgut, which, despite its name is made from sheep or goat intestines which are dried out. Most modern strings used in the 2010s are wound with metallic materials like aluminum, titanium and chromium. Cellists may mix different types of strings on their instruments. The pitches of the open strings are C, G, D, and A (black note heads in the playing range figure above), unless alternative tuning (scordatura) is specified by the composer. Some composers (e.g. Ottorino Respighi in the final movement of ‘’The Pines of Rome’’) ask that the low C be tuned down to a B♭ or B so that the performer can play a different low note on the lowest open string. The tailpiece and endpin are found in the lower part of the cello. 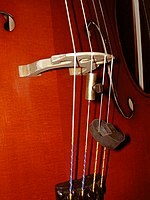 The tailpiece is the part of the cello to which the "ball ends" of the strings are attached by passing them through holes. The tailpiece is attached to the bottom of the cello. The tailpiece is traditionally made of ebony or another hard wood, but can also be made of plastic or steel on lower-cost instruments. It attaches the strings to the lower end of the cello, and can have one or more fine tuners. The fine tuners are used to make smaller adjustments to the pitch of the string. The fine tuners can increase the tension of each string (raising the pitch) or decrease the tension of the string (lowering the pitch). When the performer is putting on a new string, the fine tuner for that string is normally reset to a middle position, and then the peg is turned to bring the string up to pitch. The fine turners are used for subtle, minor adjustments to pitch, such as tuning a cello to the oboe's 440 Hz A note or to tune the cello to a piano. The endpin or spike is made of wood, metal or rigid carbon fibre and supports the cello in playing position. The endpin can be retracted into the hollow body of the instrument when the cello is being transported in its case. This makes the cello easier to move about. When the performer wishes to play the cello, the endpin is pulled out to lengthen it. The endpin is locked into the player's preferred length with a screw mechanism. The adjustable nature of endpins enables performers of different ages and body sizes to adjust the endpin length to suit them. In the Baroque period the cello was held between the calves, as there was no endpin at that time. The endpin was "introduced by Adrien Servais c. 1845 to give the instrument greater stability". Modern endpins are retractable and adjustable; older ones were removed when not in use. (The word "endpin" sometimes also refers to the button of wood located at this place in all instruments in the violin family, but this is usually called "tailpin".) The sharp tip of the cello's endpin is sometimes capped with a rubber tip that protects the tip from dulling and prevents the cello from slipping on the floor. Many cellists use a rubber pad with a metal cup to keep the tip from slipping on the floor. A number of accessories to keep the endpin from slipping; these include ropes which attach to the chair leg and other devices. The bridge holds the strings above the cello and transfers their vibrations to the top of the instrument and the soundpost inside (see below). The bridge is not glued, but rather held in place by the tension of the strings. The bridge is usually positioned by the cross point of the "f-hole" (i.e., where the horizontal line occurs in the "f"). The f-holes, named for their shape, are located on either side of the bridge, and allow air to move in and out of the instrument as part of the sound-production process. They probably actually stand for an old style medial S, for words related to Sound. The f-holes also act as access points to the interior of the cello for repairs or maintenance. Sometimes a small length of rubber hose containing a water-soaked sponge, called a Dampit, is inserted through the f-holes, and serves as a humidifier. This keeps the wood components of the cello from drying out. Internally, the cello has two important features: a bass bar, which is glued to the underside of the top of the instrument, and a round wooden sound post, a solid wooden cylinder which is wedged between the top and bottom plates. The bass bar, found under the bass foot of the bridge, serves to support the cello's top and distribute the vibrations from the strings to the body of the instrument. The sound post, found under the treble side of the bridge, connects the back and front of the cello. Like the bridge, the sound post is not glued, but is kept in place by the tensions of the bridge and strings. Together, the bass bar and sound post transfer the strings' vibrations to the top (front) of the instrument (and to a lesser extent the back), acting as a diaphragm to produce the instrument's sound. Cellos are constructed and repaired using hide glue, which is strong but reversible, allowing for disassembly when needed. Tops may be glued on with diluted glue, since some repairs call for the removal of the top. Theoretically, hide glue is weaker than the body's wood, so as the top or back shrinks side-to-side, the glue holding it lets go, so the plate does not crack. Cellists repairing cracks in their cello do not use regular wood glue, because it cannot be steamed open when a repair has to be made by a luthier. Traditionally, bows are made from pernambuco or brazilwood. Both come from the same species of tree (Caesalpinia echinata), but pernambuco, used for higher-quality bows, is the heartwood of the tree and is darker in color than brazilwood (which is sometimes stained to compensate). Pernambuco is a heavy, resinous wood with great elasticity, which makes it an ideal wood for instrument bows. Horsehair is stretched out between the two ends of the bow. The taut horsehair is drawn over the strings to produce the cello's characteristic tone. A small knob is twisted to increase or decrease the tension of the horsehair. The tension on the bow is released when the instrument is not being used. The amount of tension a cellist puts on the bow hair depends on the preferences of the player, the style of music being played, and for students, the preferences of their teacher. Bows are also made from other materials, such as carbon-fibre—stronger than wood—and fiberglass (often used to make inexpensive, lower-quality student bows). An average cello bow is 73 cm (29 in) long (shorter than a violin or viola bow) 3 cm (1.2 in) high (from the frog to the stick) and 1.5 cm (0.59 in) wide. The frog of a cello bow typically has a rounded corner like that of a viola bow, but is wider. A cello bow is roughly 10 g (0.35 oz) heavier than a viola bow, which in turn is roughly 10 g (0.35 oz) heavier than a violin bow. Bow hair is traditionally horsehair, though synthetic hair, in varying colors, is also used. Prior to playing, the musician tightens the bow by turning a screw to pull the frog (the part of the bow under the hand) back, and increase the tension of the hair. Rosin is applied by the player to make the hair sticky. Bows need to be re-haired periodically. Baroque style (1600–1750) cello bows were much thicker and were formed with a larger outward arch when compared to modern cello bows. The inward arch of a modern cello bow produces greater tension, which in turn gives off a louder sound. The cello bow has also been used to play electric guitars. Jimmy Page pioneered its application on tracks such as "Dazed and Confused". The post-rock Icelandic band Sigur Rós's lead singer often plays a guitar using a cello bow. In 1989, the German cellist Michael Bach began developing a curved bow, encouraged by John Cage, Dieter Schnebel, Mstislav Rostropovich and Luigi Colani: and since then many pieces have been composed especially for it. This curved bow (BACH.Bow) is a convex curved bow which, unlike the ordinary bow, renders possible polyphonic playing on the various strings of the instrument. The solo repertoire for violin and cello by J. S. Bach the BACH.Bow is particularly suited to it: and it was developed with this in mind, polyphonic playing being required, as well as monophonic. When a string is bowed or plucked, it vibrates and moves the air around it, producing sound waves. Because the string is quite thin, not much air is moved by the string itself, and consequently if the string was not mounted on a hollow body, the sound would be weak. In acoustic stringed instruments such as the cello, this lack of volume is solved by mounting the vibrating string on a larger hollow wooden body. The vibrations are transmitted to the larger body, which can move more air and produce a louder sound. Different designs of the instrument produces variations in the instrument’s vibrational patterns and thus changes the character of the sound produced. A string’s fundamental pitch can be adjusted by changing its stiffness, which depends on tension and length. Tightening a string stiffens it by increasing both the outward forces along its length and the net forces it experiences during a distortion. A cello can be tuned by adjusting the tension of its strings, by turning the tuning pegs mounted on its pegbox, and tension adjusters (fine tuners) on the tail piece. A string’s length also affects its fundamental pitch. Shortening a string stiffens it by increasing its curvature during a distortion and subjecting it to larger net forces. Shortening the string also reduces its mass, but does not alter the mass per unit length, and it is the latter ratio rather than the total mass which governs the frequency. The string vibrates in a standing wave whose speed of propagation is given by √T/m, where T is the tension and m is the mass per unit length; there is a node at either end of the vibrating length, and thus the vibrating length l is half a wavelength. Since the frequency of any wave is equal to the speed divided by the wavelength, we have frequency = 1/2l × √T/m. (Note that some writers, including Muncaster (cited below) use the Greek letter μ in place of m.) Thus shortening a string increases the frequency, and thus the pitch. Because of this effect, you can raise and change the pitch of a string by pressing it against the fingerboard in the cello’s neck and effectively shortening it. Likewise strings with less mass per unit length, if under the same tension, will have a higher frequency and thus higher pitch than more massive strings. This is a prime reason why the different strings on all string instruments have different fundamental pitches, with the lightest strings having the highest pitches. A played note of E or F♯ has a frequency which is often very close to the natural resonating frequency of the body of the instrument, and if the problem is not addressed this can set the body into near resonance. This may cause an unpleasant sudden amplification of this pitch, and additionally a loud beating sound results from the interference produced between these nearby frequencies; this is known as the “wolf tone” because it is an unpleasant growling sound. The wood resonance appears to be split into two frequencies by the driving force of the sounding string. These two periodic resonances beat with each other. This wolf tone must be eliminated or significantly reduced for the cello to play the nearby notes with a pleasant tone. This can be accomplished by modifying the cello front plate, attaching a wolf eliminator (a metal cylinder or a rubber cylinder encased in metal), or moving the sound post. Spectrogram of a D chord arpeggiated on the cello. Yellow bands at the same level indicate the same harmonics excited by the bowing of different notes. Notes played from left to right: D–F♯–A–F♯–D. When a string is bowed or plucked to produce a note, the fundamental note is accompanied by higher frequency overtones. Each sound has a particular recipe of frequencies that combine to make the total sound. Playing the cello is done while seated with the instrument supported on the floor by the endpin. The left hand fingertips stop the strings on the fingerboard, determining the pitch of the fingered note. The right hand plucks or bows the strings to sound the notes. The left hand fingertips stop the strings along their length, determining the pitch of each fingered note. Stopping the string closer to the bridge results in higher-pitched sound, because the vibrating string length has been shortened. In the neck positions (which use just less than half of the fingerboard, nearest the top of the instrument), the thumb rests on the back of the neck; in thumb position (a general name for notes on the remainder of the fingerboard) the thumb usually rests alongside the fingers on the string and the side of the thumb is used to play notes. The fingers are normally held curved with each knuckle bent, with the fingertips in contact with the string. If a finger is required on two (or more) strings at once to play perfect fifths (in double stops or chords) it is used flat. In slower, or more expressive playing, the contact point can move slightly away from the nail to the pad of the finger, allowing a fuller vibrato. Vibrato is a small oscillation in the pitch of a note, usually considered expressive. Harmonics played on the cello fall into two classes; natural and artificial. Natural harmonics are produced by lightly touching (but not depressing) the string with the finger at certain places, and then bowing (or, rarely, plucking) the string. For example, the halfway point of the string will produce a harmonic that is one octave above the unfingered (open) string. Natural harmonics only produce notes that are part of the harmonic series on a particular string. 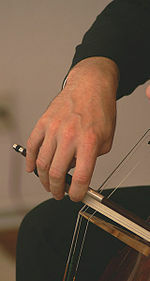 Artificial harmonics (also called false harmonics or stopped harmonics), in which the player depresses the string fully with one finger while touching the same string lightly with another finger, can produce any note above middle C. Glissando (Italian for "sliding") is an effect played by sliding the finger up or down the fingerboard without releasing the string. This causes the pitch to rise and fall smoothly, without separate, discernible steps. In cello playing, the bow is much like the breath of a wind instrument player. Arguably, it is the major determinant in the expressiveness of the playing. The right hand holds the bow and controls the duration and character of the notes. The bow is drawn across the strings roughly halfway between the end of the fingerboard and the bridge, in a direction perpendicular to the strings. The bow is held with all five fingers of the right hand, the thumb opposite the fingers and closer to the cellist's body. Tone production and volume of sound depend on a combination of several factors. The three most important ones are: bow speed, weight applied to the string, and point of contact of the bow hair with the string. Double stops involve the playing of two notes at the same time. Two strings are fingered simultaneously, and the bow is drawn so as to sound them both at once. In pizzicato playing, the string is plucked directly with the fingers or thumb. Pizzicato is often abbreviated as "Pizz.". Position of the hand is slightly over the finger board and away from the bridge. A player using the col legno technique strikes or rubs the strings with the wood of the bow rather than the hair. In spiccato playing, the strings are not "drawn" by the bow hair but struck by it, while still retaining some horizontal motion, to generate a more percussive, crisp sound. In staccato, the player moves the bow a small distance and stops it on the string, making a short sound, the rest of the written duration being taken up by silence. Legato is a technique where the notes are smoothly connected without accents or breaks. It is noted by a slur (curved line) above or below – depending on their position on the staff – the notes of the passage that is to be played legato. Sul ponticello ("on the bridge") refers to bowing closer to the bridge, while sul tasto ("on the fingerboard") calls for bowing nearer the end of the fingerboard. Sul tasto produces a more flute-like sound, with more emphasis on the fundamental frequency of the note, and softer overtones. Standard-sized cellos are referred to as "full-size" or "​4⁄4" but are also made in smaller (fractional) sizes (e.g. ​7⁄8, ​3⁄4, ​1⁄2, ​1⁄4, ​1⁄8, ​1⁄10, ​1⁄16). The fractions refer to volume rather than length, so a 1/2 size cello is much longer than half the length of a full size. The smaller cellos are identical to standard cellos in construction, range, and usage, but are simply scaled-down for the benefit of children and shorter adults. Cellos in sizes larger than ​4⁄4 do exist, and cellists with unusually large hands may require such a non-standard instrument. Cellos made before approximately 1700 tended to be considerably larger than those made and commonly played today. Around 1680, changes in string-making technology made it possible to play lower-pitched notes on shorter strings. The cellos of Stradivari, for example, can be clearly divided into two models: the style made before 1702, characterized by larger instruments (of which only three exist in their original size and configuration), and the style made during and after 1707, when Stradivari began making smaller cellos. This later model is the design most commonly used by modern luthiers. The scale length of a ​4⁄4 cello is about 70 cm (27 1⁄2 in). The new size offered fuller tonal projection and greater range of expression. The instrument in this form was able to contribute to more pieces musically and offered the possibility of greater physical dexterity for the player to develop technique. Cases are used to protect the cello and bow (or multiple bows). Rosin is applied to bow hair to increase the friction of the bow on the strings. Rosin, made from resins tapped from conifers, is applied to the bow hair to increase the effectiveness of the friction, grip or bite, and allow proper sound production. Rosin may have additives to modify the friction such as beeswax, gold, silver or tin. Commonly, rosins are classified as either dark or light, referring to color. Endpin stops or straps (tradenames include Rockstop and Black Hole) keep the cello from sliding if the endpin does not have a rubber piece on the end, or if a floor is particularly slippery. Wolf tone eliminators are placed on cello strings between the tailpiece and the bridge to eliminate acoustic anomalies known as wolf tones or "wolfs". Mutes are used to change the sound of the cello by adding mass and stiffness to the bridge. They alter the overtone structure, modifying the timbre and reducing the overall volume of sound produced by the instrument. Metronomes provide a steady tempo by sounding out a certain number of beats per minute. A person who plays the cello is called a cellist. For a list of notable cellists, see the list of cellists and Category:Cellists. Careers in cello vary widely by genre and by region or country. Most cellists earn their living from a mixture of performance and teaching jobs. The first step to getting most performance jobs is by playing at an audition. In some styles of music, cellists may be asked to sight read printed music or perform standard repertoire with an ensemble. In classical music, cellists audition for playing jobs in orchestras and for admission into university or Conservatory programs or degrees. At a classical cello audition, the performer typically plays a movement from a Bach suite or a movement from a concerto and a variety of excerpts from the orchestral literature. Orchestral auditions are typically held in front of a panel that includes the conductor, the Concertmaster, the Principal cellist and other principal players. The most promising candidates are invited to return for a second or third round of auditions, which allows the conductor and the panel to compare the best candidates. Performers may be asked to sight read orchestral music. The final stage of the audition process in some orchestras is a test week, in which the performer plays with the orchestra for a week or two, which allows the conductor and principal players to see if the individual can function well in an actual performance setting. Performance jobs include playing as a freelancer in small groups, playing in a chamber music group, large ensembles, or performing solo music, either live onstage or as a session player for radio or TV broadcasts or for recordings; and working as the employee of an orchestra, big band, or recording studio. Many cello players find extra work by substituting ("subbing") for cellists who are double-booked or ill. It is hard for many cello players to be able to find full-time, full-year work at a single job. About the closest that a cellist can come to this is in the case of those who win an audition at a professional orchestra. Even full-time orchestra jobs do not usually last for the entire year. When the orchestra stops playing (which is often in the summer), orchestral cellists have to find other work, either as a teacher or coach, or in another group. Teaching work for cellists includes giving private lessons in the home or at colleges and universities; coaching cellists who are preparing for recordings or auditions; doing group coaching at music camps or for youth ensembles; and working as a high school music teacher. Due to the limited number of full-time orchestral jobs, many classical cellists are not able to find full-time work with a single orchestra. Some cellists increase their employ-ability by learning several different styles, such as folk or pop. In some cases, cellists supplement their performing and teaching income with other related music jobs, such as working as a stringed instrument repairer (luthier); as a contractor who hires musicians for orchestras or big bands, composing music, songwriting, conducting, or organizing festivals (e.g., Julian Armour). the "King", by Andrea Amati, is one of the oldest known cellos, built between 1538 and 1560—it is in the collection of the National Music Museum in South Dakota. Servais Stradivarius is in the collection of the Smithsonian Institution, Washington DC. Batta-Piatigorsky Stradivarius, played by Gregor Piatigorsky. Davidov Stradivarius, played by Jacqueline du Pré, currently played by Yo-Yo Ma. Barjansky Stradivarius, played by Julian Lloyd Webber. Bonjour Stradivarius, played by Soo Bae. Paganini-Ladenburg Stradivarius, played by Clive Greensmith of the Tokyo String Quartet. Duport Stradivarius, formerly played by Mstislav Rostropovich. Piatti Stradivarius, 1720, played by Carlos Prieto. ^ "violoncello noun – Pronunciation". Oxfordlearnersdictionaries.com. Retrieved October 4, 2016. ^ "Violoncello". Merriam-Webster. Retrieved October 4, 2016. ^ a b Delbanco, Nicholas (January 1, 2001). "The Countess of Stanlein Restored". Harper's Magazine. Archived from the original on January 8, 2009. Retrieved 4 October 2016. ^ Leyla Mamedova; Isin Metin; Nuran Ekici; Murad Huseyinov; Gulara Huseyinova; Mehmet Kanter (2007). "An Ultrastructural Study on the Effects of Different Musical Timbres on the Skeletal Muscle Cells". Asian Journal of Cell Biology. 2 (2): 43–49. Archived from the original on 7 December 2008. Retrieved 4 October 2016. ^ "Rihanna feat. Ne Yo - Umbrella & hate that i love you live american music awards 2007". YouTube. December 25, 2015. ^ a b Cyr, Mary. "Basses and basse continue in the Orchestra of the Paris Opéra 1700–1764". Early Music. X (Apr., 1982): 155–170. doi:10.1093/earlyj/10.2.155. ^ Marsh, Gregory and Elizabeth (March 7, 2016). "The Endpin – The Classy Musician". Theclassymusician.com. Retrieved October 4, 2016. ^ "Cello Playing in 18th Century Italy". Cello.org. Retrieved October 4, 2016. ^ Chris Museler (January 18, 2009). "Cold Case: Luis and Clark Carbon Expedition for Yo-Yo Ma?". The New York Times. Retrieved October 4, 2016. ^ van Lier, Josephine (2006). "Luis and Clark Carbon Fibre Cells" (PDF). Alberta String Association. Archived from the original (PDF) on April 7, 2014. Retrieved 4 October 2016. ^ Stowell, Robin (June 28, 1999). The Cambridge Companion to the Cello. Cambridge University Press. ISBN 978-0-521-62101-4. ^ Eric Halfpenny; Theodore C Grame. "Stringed instrument". britannica.com. Retrieved October 4, 2016. ^ As opposed to the German bow popular in baroque era, held underhand. ^ Cowling, Elizabeth (1983). The cello. C. Scribner's Sons. ISBN 978-0-684-17870-7. ^ Bloomfield, Louis (2001). How things work: the physics of everyday life. Wiley. ISBN 978-0-471-38151-8. ^ Muncaster, Roger (1993). A-level Physics. Nelson Thornes. ISBN 978-0-7487-1584-8. ^ Berg, Richard E.; Stork, David G. (2005). The Physics of Sound. Pearson Prentice Hall. ISBN 978-0-13-145789-8. ^ Chattopadhyay, D. (January 1, 2004). Elements Of Physics. New Age International. ISBN 978-81-224-1538-4. ^ Stowell, Robin (November 13, 2003). The Cambridge Companion to the String Quartet. Cambridge University Press. ISBN 978-0-521-00042-0. ^ Alan Stevenson. "Table of 'cello measurements". Archived from the original on 2008-01-04. Retrieved 2007-10-26. ^ "Collections". Nmmusd.org. Retrieved October 4, 2016. Cyr, Mary. "Basses and basse continue in the Orchestra of the Paris Opéra 1700–1764". Early Music. X (Apr., 1982): 155–170. doi:10.1093/earlyj/10.2.155. Grassineau, James (1740). A Musical Dictionary. London: J. Wilcox. VIOLONCELLO of the Italians, is properly what we call the Bass Violin with four strings, sometimes even five or six; but those are not common, the first being most used among us. Holman, Peter (1982). "The English Royal Violin Consort in the Sixteenth Century". Proceedings of the Royal Musical Association. 109: 39–59. doi:10.1093/jrma/109.1.39. Jesselson, Robert. "The Etymology of Violoncello: Implications on Literature in the Early History of the Cello". Strings Magazine. No. 22 (JAN/FEB 1991). "The King Violoncello by Andrea Amati, Cremona, after 1538". National Music Museum. Retrieved 2008-11-02. Woodfield, Ian (1984) . Howard Mayer Brown; Peter le Huray; John Stevens, eds. The Early History of the Viol. Cambridge: Cambridge University Press. ISBN 0-521-24292-4. Ghigi, Marcella (1999). Il violoncello. Conoscere la tecnica per esprimere la musica. Milano: Casa Musicale Sonzogno. ISBN 88-87318-08-5. With a preface by Mario Brunello. Pleeth, William (1982). Cello. Kahn & Averill. ISBN 978-1-871082-38-8. 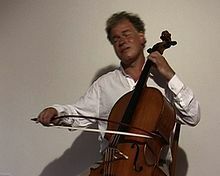 Wikimedia Commons has media related to Cello. Wikisource has the text of the 1911 Encyclopædia Britannica article Violoncello.